Each of these principles contributes to the overall success of your space. Today we will be focusing on scale and proportion, which ensures objects placed in a space look like they belong to each other; A harmony that is established through size, dimension, shape, or color of objects and how they relate to one another. Scale and proportion can be tricky to get right in interior design. Choose elements that are too large for a space and the room will feel crowded. Placing objects that are too small in a room can make a space feel awkward or unfinished. Today we will discuss how to strike a balance in how the objects in your room relate to one another. The wallpaper in the photo below is in proportion to the furnishings near it. A room this size can handle the large trellis print. 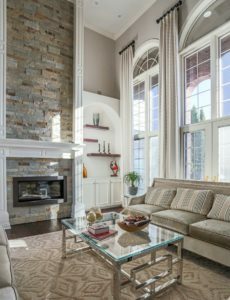 In the photo below, the window treatments by RM Coco are well suited for the size and scale of the room. The print on the fabric relates well to the rest of the prints in the room and the length of the draperies are in proportion to the fireplace surround and trim. 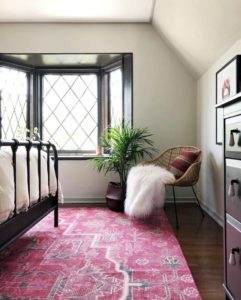 A common scale mistake is choosing a rug that is too small for a room. Below is a photo of a well-sized Kaleen rug. It leaves about 18” around the perimeter of the room, which is an ideal size for a bedroom or living room. If you are looking to address the scale and proportion of your space, come see us at Columbia Paint or Clarksville Paint and Decorating Design Centers for one on one assistance. 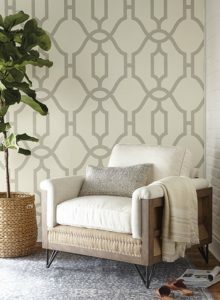 We are a Benjamin Moore Paint and Fine Paints of Europe dealer, and have over 300 wallcovering and fabric books. We also carry rugs, window coverings, and everything you need to paint your space. Stay tuned for next week’s design principle feature; We will be providing more tips and tricks to DIY your interior design.